Long Night of Shows – MPH & ToyQube! Well today I went to both the Thought Processor show at MPH and the Power Arts for Power Up show at ToyQube and have to say both were dope! I really appreciate having pieces in both shows and it’s not often you get to participate in 2 really different yet really cool shows, both in the same night! Props to PHONETICONTROL for allowing me to be a part of the Thought Processor show, we spoke last year about it and he remembered me and allowed me to be a part of it! Also props to my friend Keith, for allowing me to participate in the awesome Mr. Power show! Props also to Nemo, who was good to see again and all the other artists; everyone did a sick job!!! Pics are now posted to my Flickr! Thought Processor & Mr Power Show Pics! “Circuitz” – Custom Mr. Power Figure! “Circuitz” is the name of my entry for the Power Arts for Power Up – Mr. Power Custom Show, May 21 to June 1, 2010 from 6-9pm at ToyQube. I’m attempting something different w/ this custom than my past ones – trying to move into a different approach/direction! Well I’m involved w/ 2 shows on the same exact date! Thought Processor, which I outlined in my previous post, at myplasticheart on May 21, and also the Power Arts for Power Up: Mr. Power Custom Show @ ToyQube. See VinylPulse for more information! I’m gonna try to make it to both shows that day! 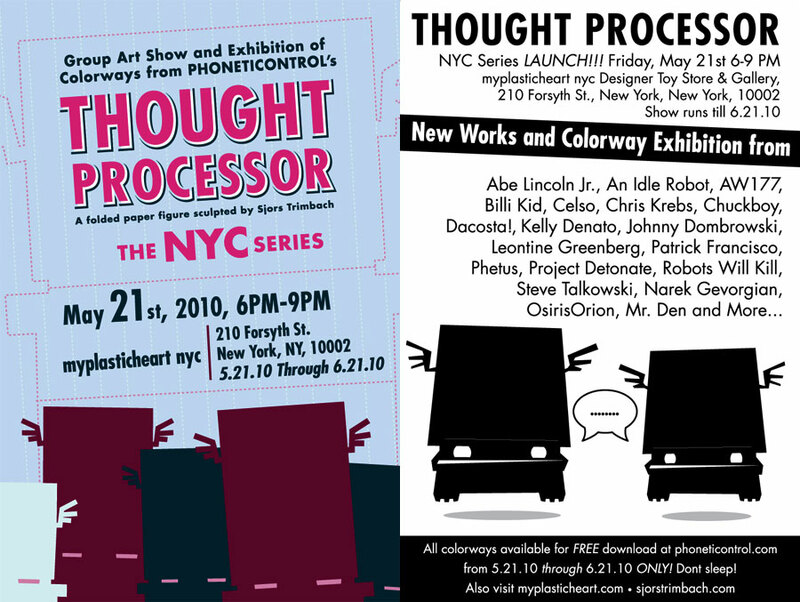 Thought Processor NYC Series Show! I was invited to create a custom Thought Processor paper toy by my friend Pocket Full of Monster’s PHONETICONTROL – I was happy to oblige! I also created a piece of 2D art to go along w/ it as well – photos will be posted soon! myplasticheart, May 21, 6-9pm. Show runs till June 21, 2010 at 210 Forsyth Street, NY, NY 10002.